Dutch Electronic Art Festival (DEAF) is a biennial international and interdisciplinary festival organized by V2_Organisation, Institute for the Unstable Media, in Rotterdam. Deaf 03 (February 25 - March 9, 2003) will explore the artistic and strategic potential of databases, knowledge management and archives in very divers forms. 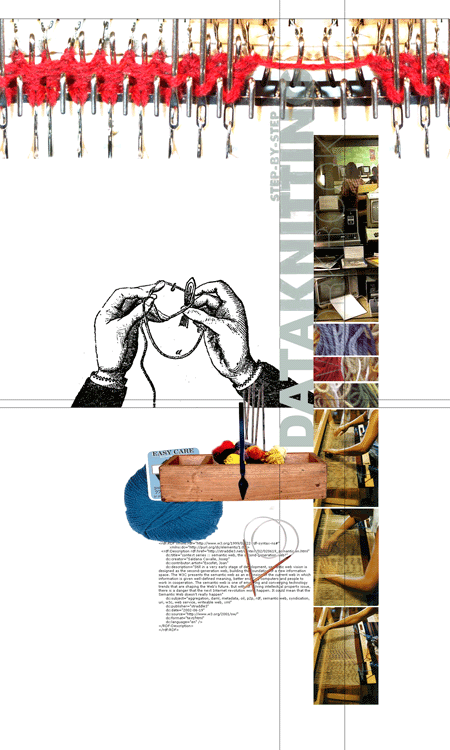 This year's theme Data Knitting ­ the interweaving of information ­ focus on the political, economical, social, historical, epistemological and software-based implications of techniques for data clustering and data combination. The program emphasize the role of interactivity as a method to manipulate, transform and individually shape media realities. In various contemporary views the archive has proved to be a strong metaphor. In the early days of the information age, digitally speaking, all data were equal then, whether they were text, image, sound, protocol, program code or whatever. Since the 1990s a new form of structuring digital archives has emerged. Now it is not just the individual data that are being stored in databases. The relationships and correlations between the various data are now also being stored, by using 'metadata' (also known as 'tags'). Metadata as means for ordering, hierarchizing, streamlining and evaluating have become increasingly important as social, political and economical instruments in what has been considered an informational sphere free of values for so long. Information isn't power, but knowledge is. Knowledge is tagged, or intelligently grouped and combined, information. Knowledge is the result of the (private or public, controllable or associative, open or concealed) knowledge management of data and data clusters. We are living in the world's online archive, or, more to the point: we are living in the world-as-archive, as a constellation of databases. V2_Organisation was founded in 1981 by a group of multimedia artists in Den Bosch as a centre for art and (media-) technology. V2_ focuses on the merging of different media and the relationships which occur between them through creative activities, especially, those activities dealing with the electronic networks, Internet and the World Wide Web. Media are increasingly becoming means to construct realities, rather than means to represent reality. Media do not depict the existing world, they replace it with a different reality, a 'media reality' or rather 'media realities'. How different media shape reality is a recurrent theme in V2_ programs. >from*From DEAF03 festival* and V2_Organisation websites. understand and interpret the world as a complex whole of interdependent parts and processes."